A Warwickshire congregation whose medieval church was largely destroyed in a blaze last Sunday have celebrated Easter in their village hall. 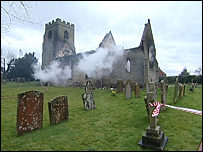 St Nicholas' Church, in Radford Semele, was gutted in a blaze which about 50 firefighters put out. More than 60 people gathered for the service earlier. Flowers were laid outside the hall by families who cannot leave them at graves because the church is currently sealed off because of safety fears. Parts of the church date back to the time of the 11th Century Doomsday Book. The wooden floors and pews were destroyed in the fire but the church's brass plates and cups escaped because they were kept in a safe. 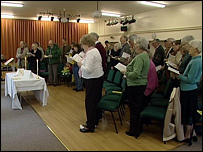 The Revd Martin Green said part of the church could be saved but services would be held at the village hall until a new church was built out of the ashes of the old one. He added: "The new church will feel very different but at the same time it's a new opportunity." Malcolm Ward, who attends the church, said the congregation were devastated by the fire but excited by the chance to build a new church. He added: "One can ask the question 'Where is God in all of this?' and the answer is he's actually with us now in our grieving. "He's alongside us to help us come to terms with this."